AnnP had the most liked content! God,family,Longarm quilting,growing vegetables and herbs and cooking with them. Making wine from my grapes. You all are so funny. You know we aren't all sleeping through this. Now may the one entry picked for the winner be one of us! Beautiful!!!!! ......No more like Amazing!!! I have Lucey, and with the stitch regulator I run it about 10. Without is what I usually use and run it about 12-13 depending on what Im quilting. When I first started longarming I started a little bit slower. Hope that helps. Millie's toggle switches have stopped working???? This just happened to me. It was the EMI Filter switch! sewing up,, Sounds like you've been going through a lot. Thats right, stay positive! Spring is on the way! And i have not been entering everyday. I just keep forgetting. Im way too busy this year. Last year I did very little vegetable gardening because of quilting. This year I started my seeds early so I will be able to have a very big garden to work this summer. And still longarm on my Lucey! Okay, I love couching! Can this be done on an APQS machine? Do you have to have the bliss for this? 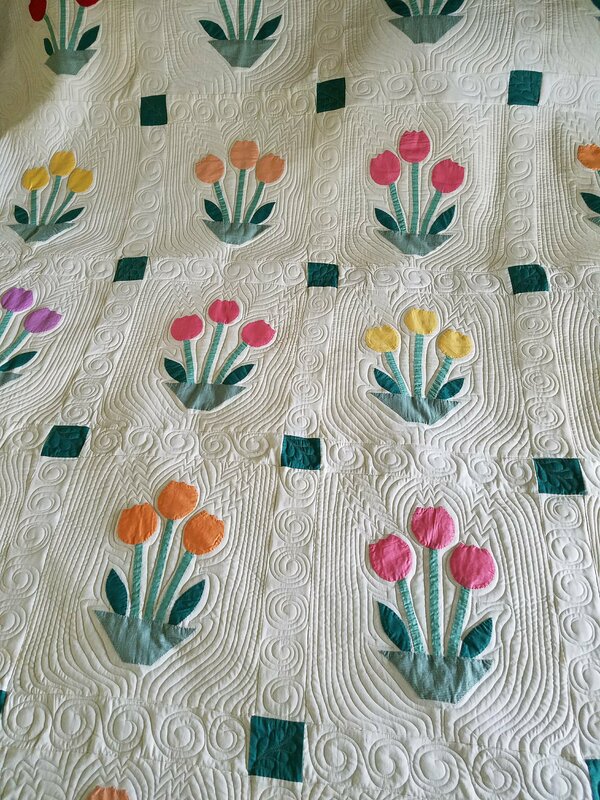 This is what I need to do if I find the time Beautiful quilt from one Ann to another! Im going too. I have Lucey! Maybe Ill see you there. I love that APQS does this so often. Recently My lucey stopped working . The EMI box is bad. They are shipping it out. I have all of a sudden a backlog of customers quilts with a sick Lucey. Sure could use a Millie to catch up the slack while Lucey is on the mend. But patience is in me and these quilts will get quilted. Thank God my customers are patience too. Whoever wins Ill be happy for!